The open ocean is the largest habitable space for life on Earth. Within this realm, called the pelagic zone, biodiversity and biomass are high—drifting animals, squids, and fishes abound, some of which can reach large sizes in the unconstrained environment. Yet, despite their size, many deep-sea animals remain elusive, and questions about their daily existence go unanswered. The depth and breadth of the pelagic ocean is so vast it is challenging for people to reach and study. Finding the answers to simple biological questions like what an animal eats can take decades, but it is getting easier. Advances in underwater technology allow researchers to observe deep-sea animals in their natural habitat and discover novel behavior. Henk-Jan Hoving, of GEOMAR Helmholtz Centre for Ocean Research Kiel, specializes in cephalopods (octopus, squid, cuttlefish, and nautilus) and Steve Haddock, of the Monterey Bay Aquarium Research Institute (MBARI), specializes in gelatinous zooplankton (medusae, ctenophores, salps, and siphonophores). Despite the disparate subjects they study they found themselves collaborating on a deep-sea mystery that for them has spanned nearly three decades. Their new paper, “The giant deep-sea octopus Haliphron atlanticus forages on gelatinous fauna,” reveals the first observations of this elusive, giant pelagic octopus with a surprising choice of prey: jellyfish! The existence of a giant pelagic octopus might come as a surprise to a non-ocean biologist, but this is not entirely unusual—MBARI researchers have only seen H. atlanticus three times in 27 years. This species is rarely seen alive, and most of what is known about it came from specimens caught in trawl nets. Haliphron atlanticus lives in the deep pelagic ocean, and most of its life is a mystery. 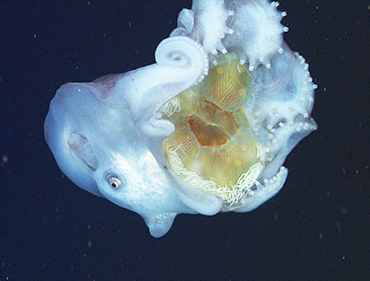 They belong to a group of octopods called Argonautoidea, which are generally small, but female Haliphrons are giants. They can be as long as the more widely recognized giant pacific octopus at four meters (13 feet), but they can weigh five times more—up to 75 kilograms (165 pounds)! The males are diminutive at about 30 centimeters (approximately 12 inches), but still considered large for the Argonautoidea clade. MBARI scientists and their collaborators have the advantage of finding elusive deep-sea species like Haliphron with the use of remotely operated vehicles (ROVs). When an ROV encounters an animal, researchers can stop, zoom in with high-resolution video cameras, and follow the organism to observe their behavior. On a recent cruise, Haddock’s team happened upon a Haliphron and as they followed it, they were surprised when it spread its arms to reveal a large jellyfish cradled in its grasp. After searching MBARI’s video archives, Hoving and Haddock found two more records of the octopus Haliphron, both of which were holding something in their arms. Because Haliphron has a cape-like webbing between its arms, it was difficult for the researchers to see what the octopuses were holding. In retrospect, they could tell that at least one of the previous specimens was also carrying a gelatinous organism. Beyond the three observed living Haliphron, Hoving analyzed the stomach contents from five specimens, and they all contained gelatinous zooplankton. Three of the octopuses had stomach contents that were easily identifiable as jellyfish, one contained a siphonophore, and one a salp. The combination of the sightings, data from stomach contents, and a literature observation is strong evidence that H. atlanticus feeds on gelatinous zooplankton. In the open ocean gelatinous zooplankton are abundant and for a slow-moving, large predator like Haliphron consuming what is readily available and easy to catch makes sense. Steve Haddock feels the general sentiment surrounding gelatinous zooplankton diets in oceanic food webs has been, “unappreciated and underestimated,” even though it is widely known that other large pelagic animals, such as ocean sunfish, leatherback sea turtles, tuna, and other large pelagic fish, also eat jellyfish. The flesh—so to speak—of these jelly-like animals is generally thought to be nutrient deficient, but the conundrum is that the animals that eat them tend to be very large. Haddock proposes the wet weight of a jelly translates to significant biomass, so what they may lack in nutrients they may make up in biomass. Haddock also suggests the defenses and escape mechanisms of gelatinous zooplankton are much easier for a slower moving, large predator like H. atlanticus to overcome. Hoving and Haddock infer that it is possible that female Haliphron, after eating the preferred nutritious parts, use the bell of the jelly with the stinging tentacles still intact as a tool. Since female Haliphron atlanticus are so large, they are able to completely grasp and contain a large jelly within their webbed arms and still swim. They use their beak to bite through the bell of the jelly to access the digestive cavity to consume the food contained within and to have access to the more nutritious parts of the jelly. At this point the jelly is dead, but the bell and fringe are still intact. Hoving and Haddock postulate that, given the way Haliphron is holding the bell with the fringe of tentacles dragging behind, the octopus could be using the sticky and stinging tentacles (which still sting after the jelly is dead) either for defense or to capture other more nutritious prey. Discovering Haliphron’s relationship with gelatinous zooplankton completes the picture for the Argonautoidea group. Prior to this discovery, out of the four families within this group, Haliphron was the only one who did not have an observed relationship with a jelly. 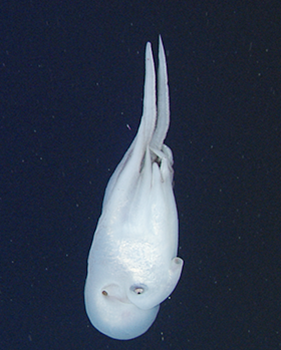 In the other three families, the juveniles and small males of the blanket octopus, Tremoctopus gracilis, carry the stinging tentacles of Portuguese man o’ war to use as defense; Ocythoe tuberculata, the football octopus, inhabit the inner cavity of salps—another kind of gelatinous drifter—probably as a refuge and to snag prey from the stream of water that the salp pumps through its cavity; and the paper nautilus Argonauta sp. 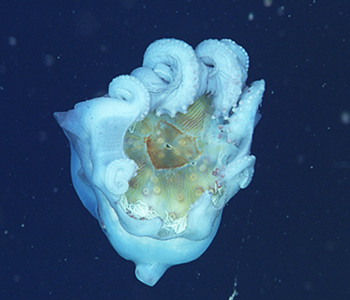 attaches onto the bell of a jellyfish and bites through it to extrude food from the digestive cavity. This latter relationship is how Haliphron was observed—implementing the same bell holding and biting technique. ROVs enabled the first observations of this novel octopod species and its even more novel behavior that revealed an unexpected role in oceanic food webs. Researchers now know that Haliphron, a food resource for top predators such as sperm whales, blue sharks, and swordfish, distributes energy to its predators along a path that incorporates gelatinous species. Hoving, H.J.T. and Haddock, S.H.D. The giant deep-sea octopus Haliphron atlanticus forages on gelatinous fauna. Sci. Rep. 7, 44952; doi: 10.1038/srep44952 (2017). March 19, 2019 – MBARI biologist Steve Haddock recently rolled out a new and improved web site that allows citizen scientists around the world to report jellyfish blooms. Jun 18, 2018 – For Cephalopod Week 2018, MBARI takes a look back at some of our most popular web stories featuring this amazing group of animals.